Visitors are always welcome at the WFAA Superpower transmitter plant pictured opposite. Drive North on Akard Street until you reach State Highway 40; turn right on 40 and drive to State Highway 114 (the Northwest Highway); turn left on 114 and it will take you directly to the plant … a 30-minute drive from downtown Dallas. So, apparently somewhere near Grapevine, where DFW Airport now sprawls. Such a cool-looking art deco building, out in the middle of nowhere. An entertaining and informative history of WFAA radio (with the incredible 50,000-watt signal that could be heard in California!) can be found here. A 1939 aerial photo of the transmitter can be seen here. Photo from the WFAA Radio Album of 1937. 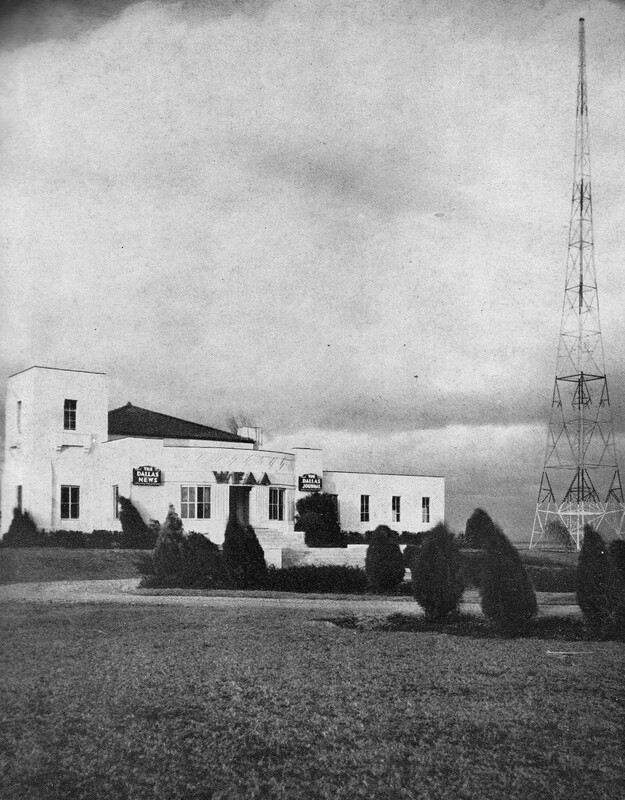 For another photo of this transmitter building and the story of “WFAA & WBAP’s Unusual Broadcasting Alliance,” see a later post here.